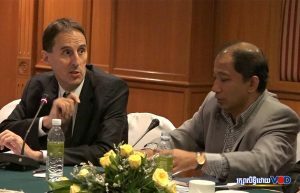 After a series of crackdowns by the Cambodian government on independent media, civil society organizations, and a main opposition party in late 2017, Western countries swiftly responded by imposing visa restrictions on Cambodia’s high-ranking officials and terminating development aid. However, Japan, as a treaty ally of the US and a democratic country sharing the values of freedom and human rights, has neither terminated its Official Development Aid (ODA) to Cambodia, nor cut its technical and financial assistance for the National Committee for Election (NEC). Speaking to the Voice of America on Dec. 22, 2017, Japan’s Ambassador to Cambodia Hidehisa Horinouchi argued that assuring the opportunity for the people of Cambodia to express their political will and strengthening the credibility of the election process were Japan’s motivations to keep assisting the NEC. But Japan’s decision to remain engaged with a troublesome NEC goes beyond transparency of the election to a long-term strategic end to shape Cambodian politics amid growing competition with China for influence. Cambodia has become an important destination for Japan’s investment, given its supply of low-cost labor, the potential for stable economic growth (averaging 7 percent for the last two decades), and the increased purchasing power of Cambodian people. The growing significance of bilateral diplomatic relations was evident when Prime Minister Abe Shinzo and Prime Minister Hun Sen upgraded diplomatic relations to a “strategic partnership” in 2013. Since then, the number of Japanese companies investing in Cambodia has rapidly increased. According to the Japan External Trade Organization (JETRO), there were just 19 Japanese companies in Cambodia in 2010. By 2015, the number had jumped to 250, making Japan the third largest foreign investor in the country. Cambodia’s geography plays a crucial role in Japanese thinking: physical infrastructure in Cambodia links Japan’s industrial bases in Thailand and Vietnam. Japan’s East-West Economic Corridor (EWEC), which was initiated in 1998 and became operational in late 2006, relies not only on human and financial capital and industrial bases in newly industrialized countries, such as Thailand, Vietnam, and Malaysia, but also on connections of physical infrastructure in mainland Southeast Asian countries. Although Cambodia was not included in the EWEC at the beginning, political instability and natural disasters in Thailand during the past decade elevated the role of Cambodia in minimizing trade and investment risks and increasing resilience of the supply chain. Massive floods in Thailand in 2011 taught Japan a bitter lesson. According to the World Bank, estimated losses were no less than $4 billion, of which Japan’s investment, particularly in the automobile industries, accounted for a considerable share. Over-reliance on Thailand is proving to be a dangerous strategy. Oizumi Keichiro, an economist at the Japan Research Institute, notes that “80 percent of investment approvals granted to Japanese business by the Thailand Board of Investment (BOI) relate to investments in Bangkok and the eight surrounding provinces” and all of them are prone to annual flooding. To cope with this growing challenge, the Thailand-Plus-One business model was initiated in 2013 not only to minimize investment risks, but also to increase Japanese competitiveness in both the regional and global supply chain. In this model, Japanese companies are advised to move labor-intensive production to one of Thailand’s neighboring countries such as Cambodia, Laos and Myanmar, while Thailand plays a role as hub of Japan’s investment and production clustering. In this strategy, Japan depends on Cambodia to supply low-cost labor and facilitate its supply chain through the country’s road network and scores of Special Economic Zones (SEZs), which were largely developed and funded by Japan’s ODA and Japanese firms. The Thailand-Plus-One strategy facilitates Japan’s EWEC and offers Cambodia great economic opportunities. Japan can expand its economic power to slow China’s growing influence in Cambodia. Although trade volume between Japan and Cambodia is far smaller than that between China and Cambodia, Japan can at least prevent China from dominating and monopolizing the Cambodian market as it did in Myanmar. Japan is optimistic that the economic opportunities facilitate stronger and deeper engagement to shape Cambodia’s politics. Direct engagement with the NEC is strategically important for Japan’s foreign policy. Japan’s ODA wins the hearts of Cambodian people, but not those of Cambodian politicians from the ruling party. Its ODA is vital for Cambodia’s development, but less effective to challenge China’s growing influence in Cambodia. 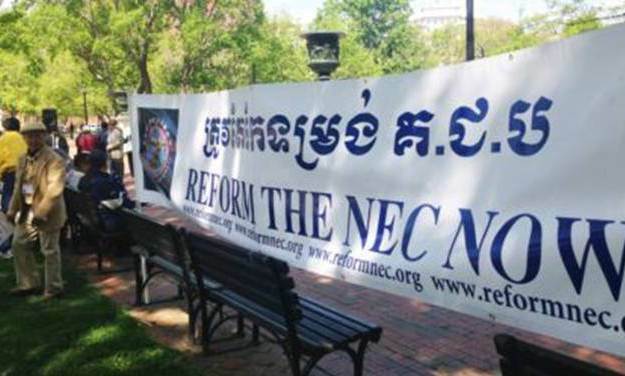 Helping the NEC, a national institution with a notorious history of alleged fraud and election manipulation, is a strategy of choice for Japan to remain a key player to engage, monitor, and if necessary put Cambodia’s election on the path of democracy. This part (103), Mr. Sophan articulated on the upcoming election of Cambodia: is it will be free and fair, prudent or controversial? As observed, previous elections, the government-led party CPP focused on “game at play” with National Election Committee (NEC), but this year, it has been outstanding for government-led party CPP that has focused on dismantling key opposition party CNRP. 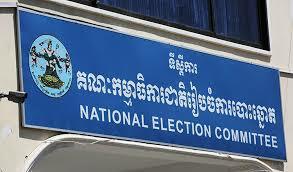 This new trend is a new political landscape and development of Cambodia. This part (98), Mr. Sophan analysed on the continual oppression of Hun Sen’s political leadership towards his main opponent CNRP. Hun Sen has failed to reform as he promised in post-election 2013 by utilizing his self-bragging expertise of political leadership to garner “divide and conquer” towards his strongest opponent. At the assembly meeting participated by CPP law-makers only, Hun Sen ranted out loud to demolish majority and minority voice in the Assembly. He spent over 15 minutes of internal regulation to over 40 minutes to include in his plan to amend the political party law aiming to get rid of convicted citizen(s) from party’s leadership, to dissolve party, and to imitate Thailand’s style of military coup detat. 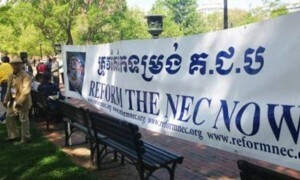 The statement to amend law in order to weaken his opponent happened in a surprise as everlasting demanding to amend law on political party on financial management and limiting public servants from involving with political party as well as be enforced by political party, was totally disregarded by Hun Sen during those 40 minutes speech. 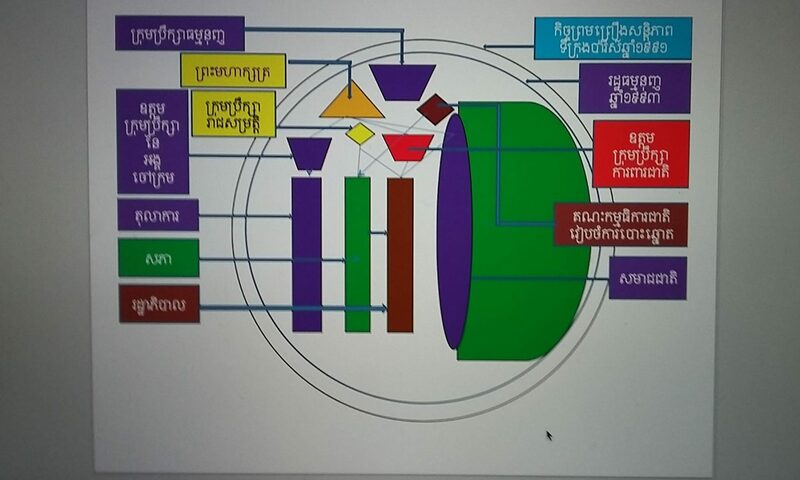 The political behaviour exposed by Hun Sen is comparing like human body that has infected by viruses internally and Hun Sen has missed routine checkup by using “rule of law” in democratic way to diagnose and schedule treatment to ensure this body is healthy. Hun Sen is fearful of his internal ringleaders more than external enemies. More often, Hun Sen is not valuing the importance of free and fair election which is comparing like the effective medication plan or doctor orders to heal the viruses. 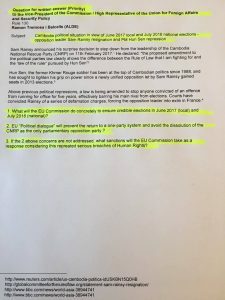 In conclusion, Mr. Sophan predicted on intend that Hun Sen has been playing is to tame the national election committee (NEC) to favor his party, and to ensure his victory, by either shutting down the NEC or the NEC agreed to declare his victory without waiting time for him to boycott the loss result. Reminding 2013 as an example, the result of election was not declared by the NEC; the result of election was declared by the Minister of Information. This part (70), broadcasted by CMN Radio on 26-27 June 2016, Mr. Sophan Seng discussed the deficits of neutrality and effective work performance of the NEC because of political influence by the government-led party. EU expressed worry on the assignment to local authority to taking part in voters registration following steps of old controversial mechanism. This latest phenomena is one among those irregularities NEC has undergone under the pressure and influence of government. NEC has difficulties to match between ID or voters registration files with database of citizens. NEC has obstacles to access to citizen-database as well as conduct its business independently especially provision laws enacted in March 24, 2015. 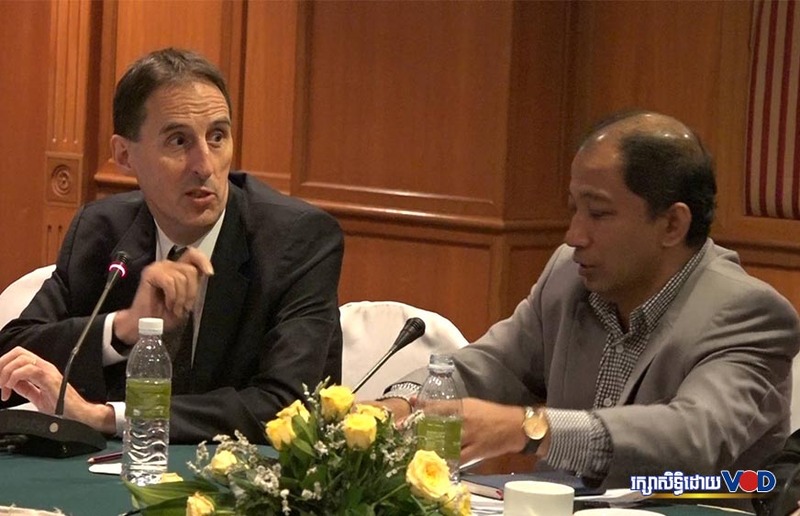 Very different from Election Committee of Canada that government and authority respected all its business operations and requests for close incorporation, Cambodia’s NEC has always been under consultations with government in all its business transactions.